Bicycle registration with PTS is now REQUIRED for everyone who bikes on campus. This includes students, faculty, staff and visitors. 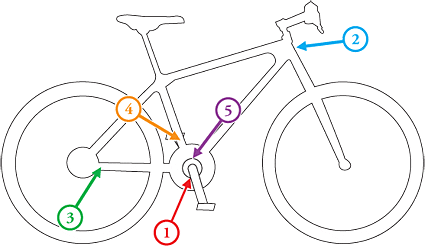 Registering your bike with PTS links your bike to you using the serial number on your bike. Bicycle serial numbers are like a car's vin number. When a bike is pawned, the pawn shop reports the serial number to the Austin Police Department which enters the number into a database to which police departments have access. Using this database, they can search for your serial number. Stolen bikes end up back on campus as well and can be returned to their owners if they are registered. The permit number that is attached to your bike serves as a theft deterrent and makes it easier to contact the owner to avoid things like impoundment if improperly locked or locked to a rack that will be replaced. The more bikes that are registered, the stronger the voice of the cycling community. The majority of serial numbers are located under the bottom bracket where the two pedal cranks meet. Simply turn your bike upside down and record the number. If there is no serial number there then check places like the headset at the front of the bike or the rear stays. The diagram at the right indicates the five most common serial number locations. If you just can't find anything then you can either engrave your driver's license number (engravers are available through UTPD) or describe the bike the best you can when registering and maybe even take a picture with it to prove ownership. The best chance at recovering a stolen bicycle is having a registered serial number. These numbers are used by police across the nation. You need the manufacturer's serial number to register your bicycle.